The split bengal gram with spinach is a tasy recipe. To soak split Bengal gram,In a pressure cooker add split Bengal gram and red lentil wash and add water and heat well. Cover and leave for 30 minutes. After 30 minutes add more water and cook till 1st whistle comes out. Cool for 10 minutes and open the pressure cooker. Add chopped spinach tomato, turmeric and salt and cook till 2nd whistle comes out. 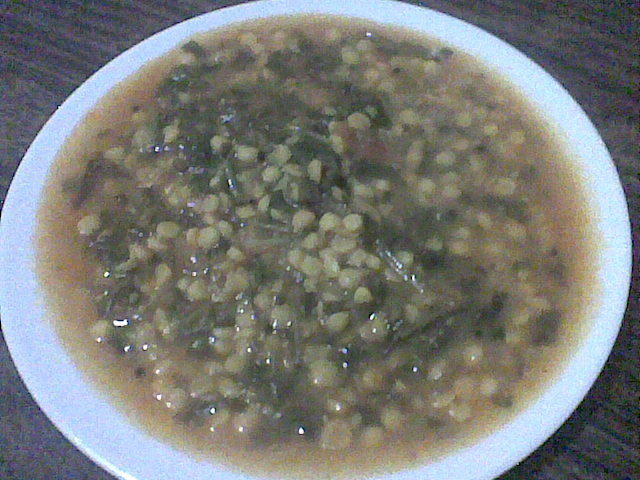 In a hot pan add oil, heat well add mustard seeds, when it splutter, add chopped onion, garlic and green chilly and sauté, lower flame and add chilly powder, garam masala and sauté add dal water from cooker and boil, so the gravy will thick and add to the cooked dal and stir well. Add salt if necessary. Now the dish is ready to serve.